Victoria’s security of payment is different to its interstate equivalents, in that it prohibits certain types of variation from being claimed under the Act. The provisions are complex, and confusing. This article explains how they work. What is a ‘claimable variation’? A variation is defined in the Act as ‘a change in the scope of work to be carried out or the goods or services to be supplied, under the contract.’ Unless the variation involves a change in the scope, it cannot be claimed. In addition to there being a change in scope, the variation must also be a ‘claimable variation’. Section 10A of the Act divides ‘claimable variations’ into two classes. Class 1 variations are variations on which the parties agree. Class 2 variations are variations on which the parties do not agree. And this is where the confusion typically starts. The flowchart below attempts to explain how it works. What is a class 1 variation? In essence, all aspects of the variation need to be agreed to fall into the first class of claimable variation. What is a class 2 variation? that work was requested or directed to be carried out by the respondent or a person authorised by the respondent in accordance with the contract. Typically, a class 2 variation arises where a contractor claims to have been requested to perform work, and performs that work, but where its claim for payment is rejected. However, there are limits on when class 2 variations can be claimed, as we explain below. When can a class 2 variation be claimed? in some cases, the value of class 2 variations that have already been claimed. This is designed to encourage parties to large contracts to rely on the dispute resolution mechanisms within the contract, apparently to avoid potential ‘log jams’ in the security of payment adjudication system. If the contract is over $5 million and there is no method for resolving disputes, there is no limit on the value of class 2 variations that can be claimed. If the contract sum is less than $150,000 at the time the contract is entered into, the Act will apply to all disputed variations. If the contract sum is more than $150,000 but less than $5 million at the time the contract is entered into, there may be a limit on the value of class 2 variations that can be claimed. This again depends on whether the contract contains a method of resolving disputes. If the contract does contain a method of resolving disputes, the value of class 2 variations that can be claimed under the Act is capped at 10% of the original contract sum. All other claims must be resolved under the dispute resolution process prescribed by the contract. If there is no method for resolving disputes, there is no limit on the value of class 2 variations that can be claimed. For example, say a construction contract has an original contract sum of $2.5 million and contains a dispute resolution clause. Assume that the contractor claims a variation at $300,000, which is disputed by the principal. The contractor’s claim exceeds 10% of the contract sum (i.e. $250,000). Because the contract sum exceeds $150,000 and the contract has a dispute resolution clause, the disputed variation will not be a claimable variation under the Act. If the contract did not contain a dispute resolution clause, the disputed variation would be a claimable variation under the Act. What is a ‘method of resolving disputes under the contract’? A process which the contract makes it a binding obligation for the parties to enter upon and participate in. How can excluded amounts be claimed? A variation that cannot be claimed under the Act is an ‘excluded amount’. Excluded amounts must not be included in payment claims, and they must not be taken into account by an adjudicator in determining an adjudication application. Excluded amounts can however be claimed under the contract. A dispute resolution process will dictate how the claim can be pursued. 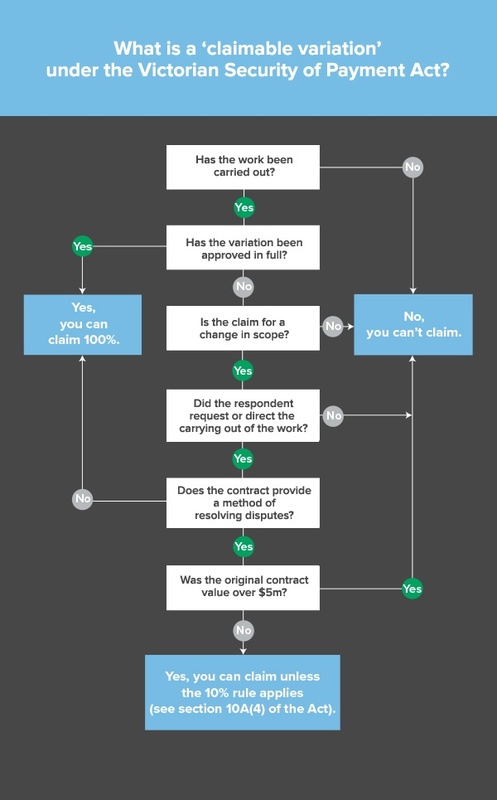 If you are a contractor seeking to recover payment for disputed variations, the security of payment legislation may be an effective avenue – but this will depend on the value of the contract, the nature of your claims and whether the contract has a dispute resolution clause, as described above. It is important to understand how your claims fit within the legislative framework. Otherwise you may find yourself wasting time and money pursuing claims under the Act that are not allowed. Similarly, if you are a principal or head contractor receiving claims (or an adjudication application) that involve disputed variations, the first thing you should do is consider whether the claims include ‘excluded amounts’ under the Act. Depending on the size and terms of your contract, the nature of the variations and the circumstances in which they arose, this may be your most effective way to defend a claim brought under the Act.